ArtLoft is located just one block from City Museum, at Washington Avenue and 16th Steet. When residents of downtown’s ArtLoft heard that someone had followed an apartment staffer into the building, up the elevator and onto the sixth floor, where the visitor apparently shot a 57-year-old tenant last week, they weren’t surprised. Police have released few details about the January 24 shooting in the building at Washington Avenue and 16th Street. Police say that the “victim and the suspect are possible acquaintances,” but cannot provide more information because the investigation is ongoing. The victim is expected to survive. Tenants say the victim had been a problem within the building. Some suspected drug issues, and court records indicate that management was in the process of evicting him. His shooting, they say, seems to have finally gotten their landlords’ attention. A security officer now guards the building, and surveillance cameras have been installed. Yet neither fact has fully solved security problems; tenants say they’ve still run into people trying to get into the building. And social media posts from residents document a litany of incidents that preceded the shooting: One video posted on Facebook shows a man with no key or keycode walking in off the street and simply pushing the door open; another post complains of two strangers spotted in the garage; and, a few days later, another post warns of a car burglary. Front door, back door, fire escape, garage door — all were intermittently broken or left open, residents say. Sometimes, says resident Jeff Miller, problems were dealt with promptly; other times, they languished for weeks. “You almost get the feeling that someone cares, sometimes,” he says. He recalls finding an outside door propped open and removing the cardboard that held it — only to overhear another tenant being admonished by a stranger for closing the door. 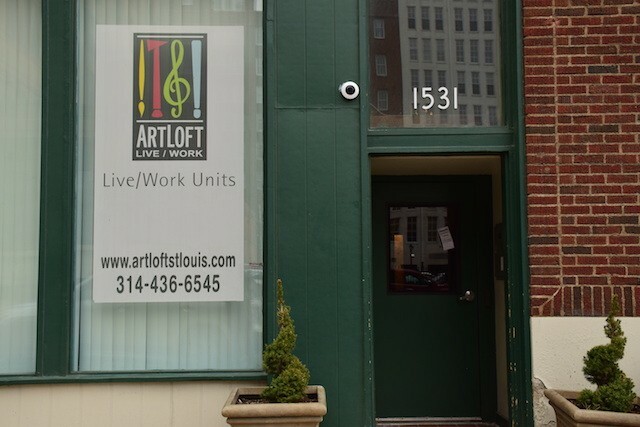 ArtLoft managers did not return five calls seeking comment. Landreth, the tenant of seventeen years, reports a number of worrisome experiences. One day, he says, he was sitting at home during the day, and he heard his door knob jiggle. He walked outside and found a stranger, who he believes was checking locks. Landreth also ran into strangers in the basement stairwell; on one occasion, he walked into men who had a pallet jack and a grocery cart outside his apartment at 10 p.m.
Art Loft wasn’t always like this. Founded in 1996, it was long a community for artists with lower incomes, a place full of “concrete boxes” that creatives mold to their desires. But when new owners took over last September, life changed. As former resident Stephanie Tolliver tells it, it had never been a palace. “Things always break in that building. They bought an old, crappy building.” But the old maintenance guy, Reggie, she recalls, was “like our family.” Once, when the garage door broke — as it routinely did — he just sat there, guarding the entrance, until it was fixed. After the purchase, that changed. “It just immediately felt very unsafe, especially with a toddler [and] with a baby on the way,” says Tolliver. Although residents say that the building’s new owners identified themselves as employees of Central PM, they’ve found a host of documentation suggesting that company is, at minimum, a close affiliate of Asprient. Property manager Jamie Wirsig’s LinkedIn profile indicates that she currently works for Asprient. A domain search undertaken by residents found that a website under Central PM's name was registered to Sumitra Chakraverty, who shares a surname with Asprient owner Sid Chakraverty. Central PM’s filings list the same registered agent as Asprient and its related properties. And the company listed as the property owner in city records bears the same registered agent, as well as contact info for one of Asprient's owners. Asprient did not respond to two messages seeking comment. As the RFT previously detailed in an August 3 cover story, St. Louis-based Asprient has a history of buying buildings and ushering in rent increases, only to draw complaints about maintenance issues, questionable charges, and withheld security deposits. Residents say that pattern has been true of Central PM. Josh Jenkins says that he wanted to give the new management a chance, even though he’d heard of Asprient’s reputation. But they failed to impress. “Everything that they been known for, they have managed to do in our short experience with them,” says Jenkins. Tenant Jeremy Genin says he’d heard of Asprient’s reputation, so when Genin heard that Central PM might be associated with the company, he began his move-out process immediately. He says he received a $700 bill for pre-existing damages — even though his an apartment was slated to be immediately renovated. As for Tolliver, she believes uncertainty made a tough situation worse. “If they had come in and said, ‘We’re the new owners, we’re gonna do our standard x amount of dollar rent increase, plan accordingly’ ... but people have no idea how much their rent’s gonna go up, if they were gonna be forced to move out,” Tolliver says. One resident heard rent would increase by $30; another heard it was $200. Tolliver says she was told she might have to relocate to another apartment in the same building once her lease was up — unless she immediately signed a new lease with higher rent (she did). 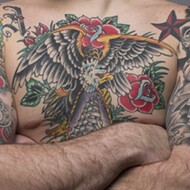 Tolliver says, “That’s really scary, especially for artists. It’s not like packing up drawers and closets; you have to dismantle all this weird stuff in your apartment.” Tolliver’s own apartment had previously featured climbing wall, with the dents to prove it, and convoluted custom shelving. Then within the first month, Tolliver says —backed up by other residents’ social media records — contractors broke a pipe, flooding the lobby and garage; keys broke off in the newly installed locks, and one resident was trapped inside his apartment on more than one occasion. Meanwhile, the man hired to change the locks was caught on video entering someone’s bedroom and maintenance kept breaking people’s things. Many tenants couldn’t afford the new rates, either. Residents of ten, fifteen years left in a “mass exodus,” says Tolliver. For those who remained, safety became a concern. Tolliver’s experiences mirror those of Landreth, Genin and Miller. “There were always people lurking by the door, waiting to get in,” she says. She also saw people wandering around the garage and hallways. And while downtown has its share of characters, Tolliver says that was something she rarely observed prior to the new owners. The Tollivers had planned to live in Art Loft for another four years, until their eldest child began kindergarten. Frustrated by the new managers, they broke their lease in December and moved out. Now the shooting has them doubly glad they did — if still frustrated by the turn of events. Editor's note: We changed one sentence of this story at 9:20 a.m. to better describe the flooding that followed Central PM's takeover of the building. It affected the lobby and garage, not "multiple floors." We regret the error.